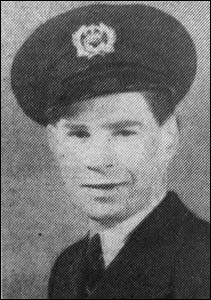 Ernest Leonard John Weller was among 24 people killed on the 17 April 1948 in a train crash near Winsford, Cheshire. This was the first significant accident on the recently nationalised British Railways system. Ernest (pictured below right) had served with the RAF in the Second World War. He was discharged from the RAF in 1944 and joined the War Department Fleet. The 22-year-old was on his way from Scotland to his parents’ home in St Mary’s Road, Llandudno, when the tragedy occurred. He was due to take up a new post in Menai Bridge the following week. He had been married for just a month. His wife Alice would have been on the same train except that she decided to return to Wales two days before her husband. The accident happened after the communication chain in the express train from Glasgow to London Euston was pulled by a young soldier, automatically bringing the train to a stop. The soldier left the train, which he had halted so that he could reach his home nearby without going into Crewe and catching a local train back to Winsford. There was a signalling error, and the following Glasgow to London postal express smashed into the stationary train. 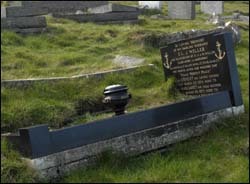 Captain Ernest Weller, Ernest’s father, was the superintendent of the British Legion car parks in North Wales. He died in 1974 and is also buried here, along with Ernest’s mother Margaret who died in 1977.